and more signing up daily. 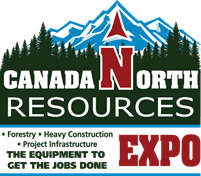 Canada Resources North Expo has strong ties to the community and local not-for-profit organizations. Giving back is an integral part of the show; past editions have included efforts to benefit AimHi, the Prince George Association for Community Living, the Salvation Army Food Bank, and significant amounts of scholarship funding for Northwest Community College. More enticing show features will be announced as the event approaches. Complete details are available on the show website: www.CNRE.ca. You can also follow the show on Facebook and Twitter.